Comparing Hard Milling and EDM Modern Machine Shop 67 The shop has also continued to make invest- ments in hard-milling capability as its effective- ness with this type of machining has improved. It expanded from nine vertical machining centers in 2010 to the 17 it has today. It came to rely on Mastercam's Dynamic Milling technique to create constant-force tool paths for cutting hard mate- rials, as well as magnetic workholding to enable maximum access during machining. The shop also increasingly invested in high-feed mills, along with quality collet toolholders for precision milling with shorter tools and shrink-fit toolholders for the longer tools that need clearance to reach deep into dies. D1's in-house polishing also became more efficient as it gained hard- milling experience. 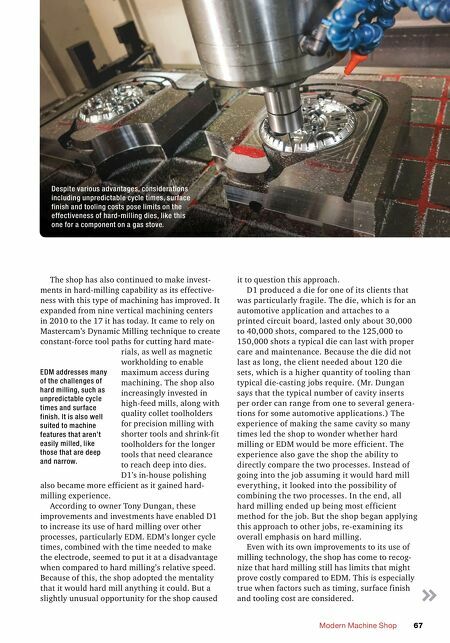 According to owner Tony Dungan, these improvements and investments have enabled D1 to increase its use of hard milling over other processes, particularly EDM. EDM's longer cycle times, combined with the time needed to make the electrode, seemed to put it at a disadvantage when compared to hard milling's relative speed. Because of this, the shop adopted the mentality that it would hard mill anything it could. 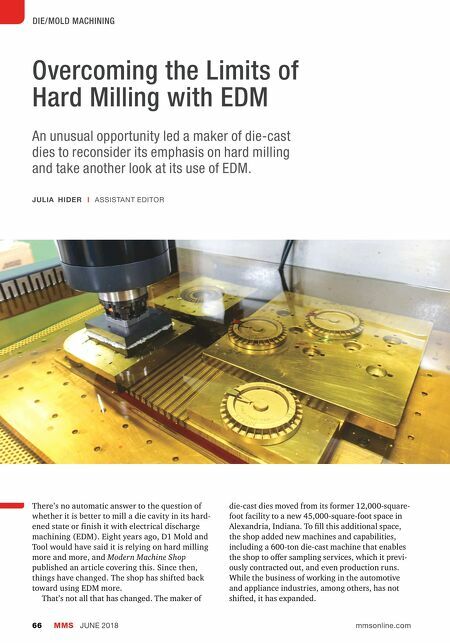 But a slightly unusual opportunity for the shop caused EDM addresses many of the challenges of hard milling, such as unpredictable cycle times and surface finish. It is also well suited to machine features that aren't easily milled, like those that are deep and narrow. it to question this approach. D1 produced a die for one of its clients that was particularly fragile. The die, which is for an automotive application and attaches to a printed circuit board, lasted only about 30,000 to 40,000 shots, compared to the 125,000 to 150,000 shots a typical die can last with proper care and maintenance. Because the die did not last as long, the client needed about 120 die sets, which is a higher quantity of tooling than typical die-casting jobs require. (Mr. Dungan says that the typical number of cavity inserts per order can range from one to several genera- tions for some automotive applications.) The experience of making the same cavity so many times led the shop to wonder whether hard milling or EDM would be more efficient. The experience also gave the shop the ability to directly compare the two processes. Instead of going into the job assuming it would hard mill ever ything, it looked into the possibility of combining the two processes. In the end, all hard milling ended up being most efficient method for the job. But the shop began applying this approach to other jobs, re-examining its overall emphasis on hard milling. Even with its own improvements to its use of milling technology, the shop has come to recog- nize that hard milling still has limits that might prove costly compared to EDM. This is especially true when factors such as timing, surface finish and tooling cost are considered. Despite various advantages, considerations including unpredictable cycle times, surface finish and tooling costs pose limits on the effectiveness of hard-milling dies, like this one for a component on a gas stove.